Failure to retract the bolt handle completely could lead to a catosrophic malfunction that is potentially fatal. Why risk it? Replace the Mossberg 930 factory charging handle with one you can easy grab during the high anxiety associated with a gun fight, the GG&G Mossberg Enhanced Tactical Charging Handle. The Enhanced Charging Handle is much larger than the factory Mossberg 930 charging handle providing a more positive method of charging, especially in stress fire situations. 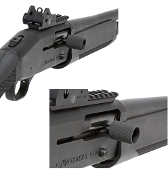 The Mossberg 930 Enhanced Tactical Charging Handle does not rotate. Manufactured from 4140 ordnance steel. Manganese phosphate finished matte black per mil-spec.